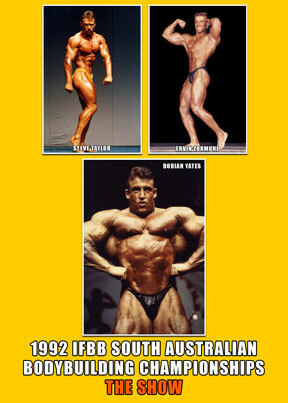 Held in Adelaide, South Australia, in late 1992, the South Australian Championships was probably the best ever IFBB contest seen in this state. Star Guest Poser was DORIAN YATES, fresh from his victory in the 1992 Mr. Olympia. With a huge, ripped and symmetrical physique, STEVE TAYLOR was the Overall Men’s winner and also took home 4 Best Body Part Awards, plus a ticket for a trip to USA. The Women’s outstanding and major winner was a very impressive and superbly conditioned physique in the name of LEE-ANNE CAMPION. If she was on an international stage, who knows what her limits may be. She is presented her award by GMV’s own Tina, on behalf of The Fitness Warehouse. 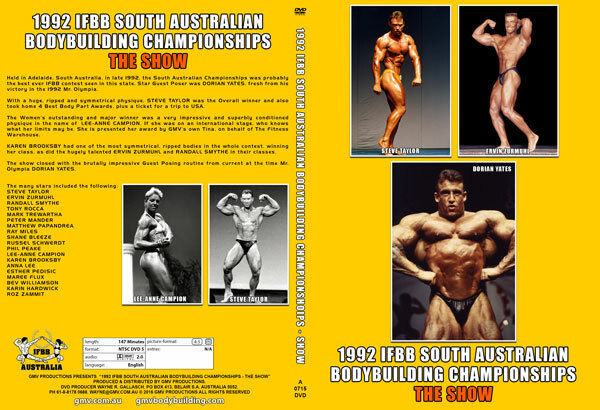 This DVD presents all of the posing routines, posedowns, presentations and winners’ brief interviews.